Conroy, Robert, and J.R. Dunn. The Day After Gettysburg . Baen 2017. 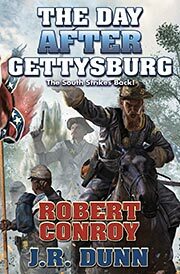 What if: The Army of Northern Virginia mustered for a major counterattck after its defeat at Gettysburg. Published: Baen 2017 (1481482513BUY), 2018 (1481483382BUY).